Samsung has introduced Galaxy J7 Pro smartphone It comes with Metal body & 13MP Front and Rear camera.check out price specs features comparison between Galaxy J7 Pro and Galaxy J7 Prime. Galaxy J7 Pro comes with Improved Design compared to Galaxy J7 Prime both Phones has Metal body and Fingerprint Scanner on the Home Button. Galaxy J7 Pro comes with a 5.5-inch ( 1920x1080 pixels) Full HD SuperAMOLED display whereas Galaxy J7 Prime has 5.5-inch Full HD 1920x1080 pixels) TFT display. Both Devices are powered by 1.6GHz Octa-Core Exynos 7870 SoC. Samsung Galaxy J7 Pro comes with 3GB of RAM and 64GB of internals storage whereas Galaxy J7 Prime has 3GB RAM and 16/32GB of internal storage further expandable with MicroSD card. On Camera, it has a 13MP Rear and front camera. Samsung Galaxy J7 Prime comes with a 13MP Rear camera and 8MP front camera. 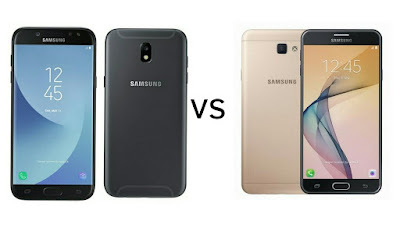 .Both Phones supports Dual-SIM,4G VoLTE, Wi-Fi 802.11 b/g/n, Bluetooth 4.1, GPS.Samsung Galaxy J7 Pro is packed with a 3600mAh Battery whereas Galaxy J7 Prime has 3300mAh Battery. Galaxy J7 Pro also support Samsung Pay which lacks in J7 Prime. Samsung Galaxy J7 Pro is priced at Rs 20,900 available from Mid July. The launch offers include a cashback of up to Rs 800 with payments made via Paytm and UPI and 120GB of extra 4G data to Jio users.Galaxy J7 Prime 16GB model is priced at Rs 15490 and Rs 16,900 for 32GB of storage.